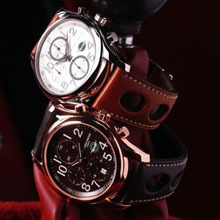 A set of timekeepers born out of pure passion ! This year, Frédérique Constant presents the ultimate set for all passionate classic car drivers: an elegant gift box offering the new limited edition Healey Chrono-Automatic timepiece, combined with a unique mechanical, handmade Stoptimer. Pure style for pure passion! To celebrate the continuing cooperation with the Austin Healey Owner Clubs around the world, Frédérique Constant introduces two new limited editions of its iconic Healey Chrono-Automatic, limited to 1’888 pieces in each version. The hand-polished, rounded case with a diameter of 43mm comes in two different finishing: elegant with a rose gold plated case, chocolate dial and leather strap, and more sporty in a steel case, silver dial with green accents and brown leather strap. Frédérique Constant is excited to be the Official Timing Partner of the 2010 Healey Challenge in the United Kingdom, organized by The Healey Drivers Club - the world’s oldest club catering to Healey enthusiasts. The Healey Drivers Club is built around the Healey family. President Brian ‘Bic’ Healey holds as much enthusiasm for the brand as the most avid Healey owner. Originally founded in 1957, the Club meets twice a month in Devon and Cornwall. The Healey Drivers Club is the point of reference for all things Healey! The story between the Swiss Watch Manufacturer Frédérique Constant and the Austin Healey Cars is a story of passion. 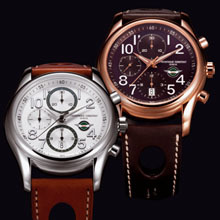 Frédérique Constant has been the annual Official Timing Partner of Healey events around the globe since 2004, such as the Second European Healey Meeting in St. Moritz, the Healey Le Mans Challenge, the Healey Challenge Heidelberg, and the 34th International Austin Healey Challenge 2009, organized by the Austin Healey Clubs of America and Canada. The 2010 Healey Challenge UK named “John Healey Memorial International Meet” will take place from May 6 till 9 in Dawlish Warren, South England, overlooking the sea and magnificent red cliffs of south Devon. During three days, the passionate Healey Owners will discover the beautiful English landscape, the actual origins of the Healey cars. And, as a subtle hint to the Healey Challenge 2010, the official logo of the event is engraved on the case back of the Frédérique Constant Healey Chrono-Automatic, alongside the aperture offering a glimpse of the automatic movement inside. Limited edition of 1’888 pieces, delivered in a special gift box with matching stop timer pocket watch. 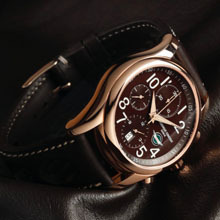 Case : Polished Rose gold plated stainless steel case, diameter of 43 mm. Convex sapphire crystal, See-through case back secured by 6 screws. Logo of the Healey Drivers Club UK, the world’s oldest Healey Club, engraving on the case back. Case : Polished stainless steel case, diameter of 43 mm. Convex sapphire crystal, See-through case back secured by 6 screws. Logo of the Healey Drivers Club UK, the world’s oldest Healey Club, engraving on the case back.